Average Jane Crafter: Sakes alive! That was a blast! Sakes alive! That was a blast! Boy howdy! 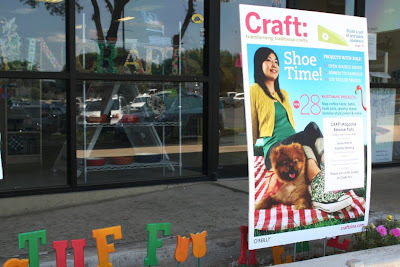 The CRAFT Magazine Release Party today was a blast! I was floored by how many people showed up (well over 100) and seeing so many people giddily crafting just made my heart swell. Everything flowed so well. The Work*Shop was the absolute perfect spot for the event. Even the kids had their own area and crafted happily while parents made our button bracelet project. I met a ton of folks with whom I've only emailed, I got to see friends whom I don't get to see nearly enough and I got to give away loads of crazy amazing door prizes to happy folks. One of my proudest moments, though, was seeing my dad stitching up a button bracelet! My mom and dad are the best people on the planet (I love them dearly) and they were so sweet to stop by today. I introduced my mom to Jenny Hart, and they got to chat about embroidery and Mah Jongg. It was so cool. We were also lucky to have had reps from CRAFT and Maker Faire in attendance. They were in Austin for Maker Faire planning and a Maker Faire Town Hall meeting and were able to come to the event. I'm hoping we knocked their socks off! They brought great door prizes - including a box set of the first year of CRAFT. They were the most coveted door prizes of the afternoon. I've already stumbled across a few blog posts about the event, which is fantastic! 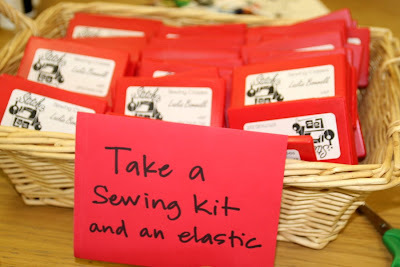 If you blog about it, please send me an email at averagejanecrafter at gmail dot com and let me know! I have a huge list of people to thank, and in the next day or so, I'll be posting links to all the folks who helped out or made announcements of interesting things today, so keep an eye out for that. 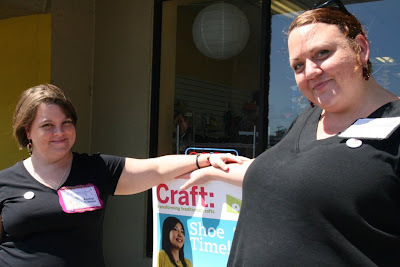 Here's one quick timely tidbit: Knitting guru, Vickie Howell, was at the party today and announced that she's just signed on as the knitting editor for Craft Gossip. She's looking to fill five posts a week with knitting news, and wants to hear from you if you've got knitting patterns, projects or books to promote. You can email her at gossip at vickiehowell dot com to send ideas. She also has a new web video series starting on Lifetime TV's web site tomorrow. Her first project will be a Fourth of July-themed felted blanket - a great project for knitters and non-knitters alike! Be sure to check it out. Lisa (pictured above) and the gals at the Work*Shop - thanks so much for letting us take over the shop - it was the most perfect space. Thanks to Jenny Hart and the Sublime Stitching gals. Jenny and Mary are always incredibly generous with their time, support and enthusiasm. 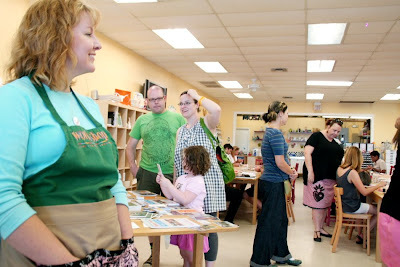 They donated great prizes and had fun chatting with all the crafty folks. Thanks to Kathie Sever, Shannon Lowry and Bernadette Noll who donated door prizes from Future Craft Collective and Round Robin Press. It was so great to finally meet all of you in person! These gals are doing really amazing things with their projects, and I highly recommend checking them out. I'm constantly floored by the incredibly creative and progressive things that are going on in Austin. I love it. 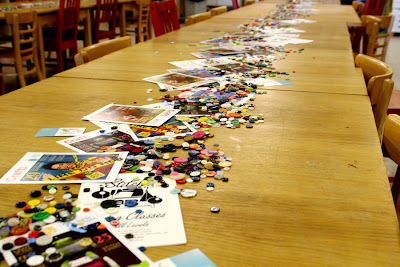 We made awesome button bracelets, munched on goodies and let the kids craft themselves crazy. Pretty much the most perfect afternoon ever. More later. I'm ready to collapse! Thanks for keeping up and coming out. Can't wait to hear what you thought of the party and to see your pictures! Looks like it was a success! I'm so happy for you. I'm sad to have missed it. Congratulations on what looked like an amazing event! I wish I could have been there...nothing cool like that ever happens where I live!